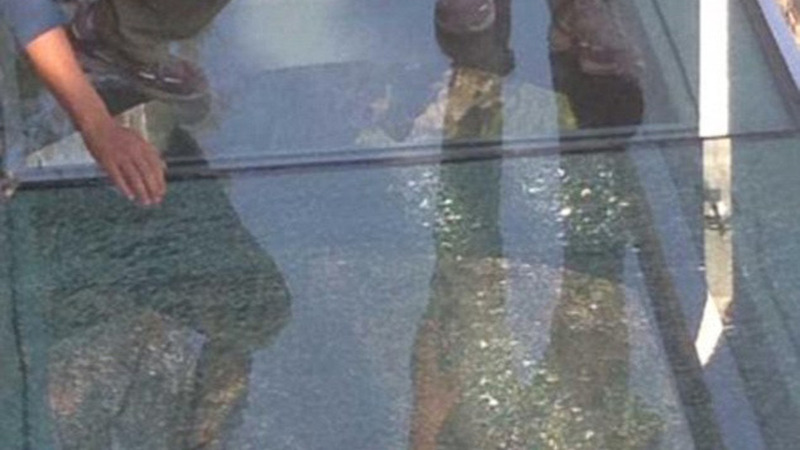 A section of a new glass-bottomed walkway at Yuntai Mountain Geological Park in Henan Province, China, cracked at around 5 p.m. Monday afternoon, causing the tourists on it to understandably freak out. The walkway is suspended at a height of about 1,080 meters, or 3,543 feet. A spokesperson for the Yuntai Mountain tourism bureau told People’s Daily Online that the cracks occurred after a tourist dropped a stainless steel mug on the walkway. Only one of a total of three layers of glass broke, so the tourists were not in danger, the spokesperson said. The U-shaped walkway, which just opened in September, is closed until further notice. ← President Obama and Michelle decided to do something out of routine …..